woman and life: Good Bye ~ Father of Nation! When I woke up this morning, first thing i grab was tv remote. I switched it on to the channel left off last night. I became fully awake as I read, Singapore's founding father dies at the age of 91. Soon after I found myself watching reports from Channel News Asia. The closing of it captured my attention much. "Could I have lived my life differently? May be yes. But probably not. At each stage, I made what was then the best choice. Having taken that decision, I changed direction and there was no turning back." It was just on that Friday night, when I had a late night concall with a Singaporean colleague and he mentioned LKY's name. We were kind of talked a bit of him; and this morning when I was right here in Singapore to start my first day of a week training, I heard this heartfelt news. Flags are at half-mast everywhere today. I had a chance to talk with new-met collegue, I got to hear how his view about the great man. On my way back to the hotel, I could also feel how the driver mourned for him, could feel Lee Kuan Yew is dearly and indeed the father of many, the father of Singapore. 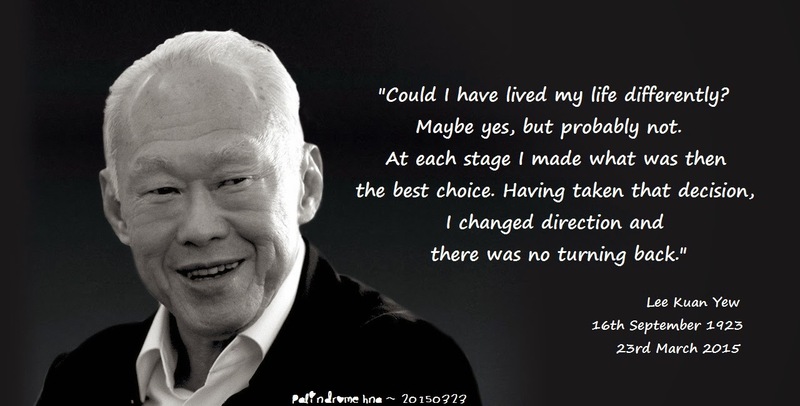 I read through his quotes, I watched some records of him, the most interesting one is he wept when Singapore separated from Malaysia. I feel the need to put some notes on this. I search and find complete script of what I watch this morning from CNA - Building a Nation. Here's PM Lee Hsien Loong's speech for his beloved father. It was live-broadcasted from the Istana 8am this morning. "The first of our founding fathers is no more. He inspired us, gave us courage, kept us together, and brought us here. He fought for our independence, built a nation where there was none, and made us proud to be Singaporeans. We won’t see another like him. " 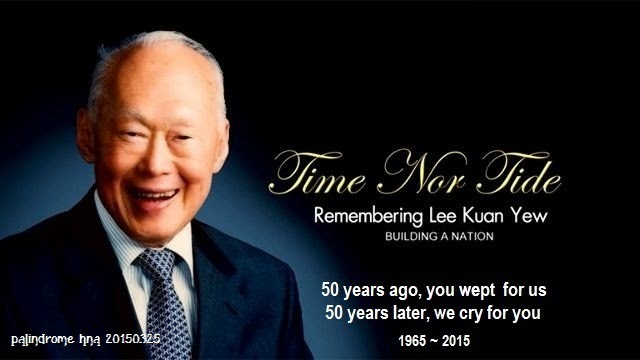 "To many Singaporeans, and indeed others too, Lee Kuan Yew was Singapore. As Prime Minister, he pushed us hard to achieve what had seemed impossible. After he stepped down, he guided his successors with wisdom and tact. In old age, he continued to keep a watchful eye on Singapore." "Singapore was his abiding passion. He gave of himself, in full measure, to Singapore. As he himself put it towards the end of his life: 'I have spent my life, so much of it, building up this country. There’s nothing more that I need to do. At the end of the day, what have I got? 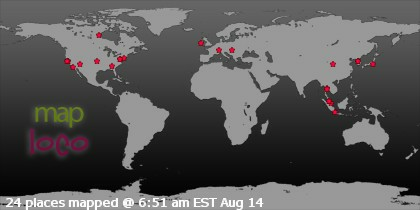 A successful Singapore. What have I given up? My life. " "I am grieved beyond words at the passing of Mr Lee Kuan Yew. I know that we all feel the same way. But even as we mourn his passing, let us also honour his spirit. 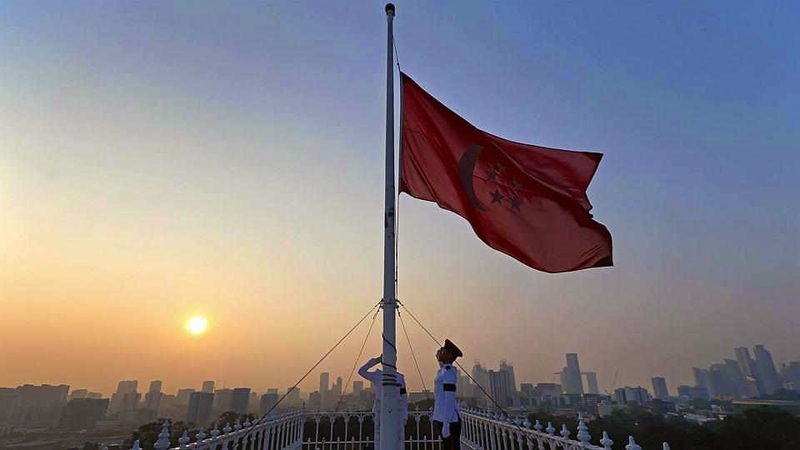 Let us dedicate ourselves as one people to build on his foundations, strive for his ideals, and keep Singapore exceptional and successful for many years to come. May Mr Lee Kuan Yew rest in peace." Good bye, Mr. Lee Kuan Yew - thank you for your vision and leadership to build such a great country around this region.